DELAWARE, OHIO – Ohio Wesleyan University senior Mark Mandych has earned a highly competitive Fulbright U.S. Scholar Program grant to spend 10 months teaching English in Germany. A resident of East Aurora, New York, Mandych is an English Literature and German Studies double major and a philosophy minor. He will begin his Fulbright Program teaching assignment in September. “Aside from teaching, I’m looking forward to meeting people and making contacts,” said Mandych, who plans to enroll in graduate school to study German translation and interpretation following his Fulbright Program experience. At Ohio Wesleyan, Mandych spent a semester studying at the University of Salzburg in Austria, and was inspired by the immersive experience. 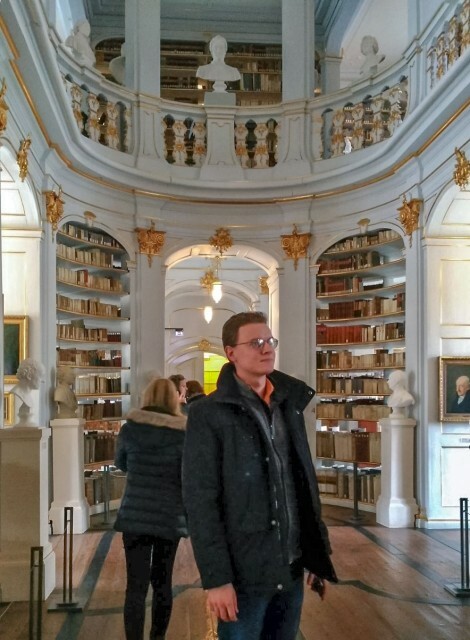 “During my semester abroad at Salzburg University, I volunteered as an English teaching assistant at a local high school to help the students prepare for the English language portion of the Matura, the national matriculation exam,” Mandych told the Fulbright Foreign Scholarship Board, which awarded his grant. “I realized that, although the students had plenty of book knowledge, they had never had the opportunity to hone their conversational skills – and it appeared they had already learned all they could from standardized worksheets. In addition to studying in Austria as an OWU student, Mandych also participated in a Travel-Learning Course that allowed him to visit Argentina as part of a “Society, Politics, and Social Movements” class taught by Paul Dean, assistant professor of sociology-anthropology. Mandych said Dean and OWU faculty members Erin Flynn (philosophy), Thomas Wolber (German), and, especially Mark Mitton-Fry (Fulbright Program advisor) all helped to guide him in his successful grant application. Also at Ohio Wesleyan, Mandych is a member of the Modern Foreign Languages Student Board and senior editorial assistant at The Historian, one of the largest scholarly history journals in the United States. In 2015, he earned the university’s Ernest F. Amy Prize as OWU’s most outstanding junior English major. Sponsored by the U.S. Department of State’s Bureau of Educational and Cultural Affairs, the Fulbright Program is designed to increase mutual understanding between people of the United States and other countries. Founded in 1946, the program currently operates in more than 160 countries. Award recipients are selected based on their academic and professional merit. To date, Fulbright Program alumni have earned 54 Nobel Prizes, 82 Pulitzer Prizes, 16 Presidential Medals of Freedom, and countless other awards and honors. For more information, visit http://eca.state.gov/fulbright. Founded in 1842, Ohio Wesleyan University is one of the nation’s premier liberal arts universities. Located in Delaware, Ohio, the private university offers 87 undergraduate majors and competes in 23 NCAA Division III varsity sports. Ohio Wesleyan combines a challenging, internationally focused curriculum with off-campus learning and leadership opportunities to connect classroom theory with real-world experience. OWU’s 1,675 students represent 43 U.S. states and territories and 33 countries. Ohio Wesleyan is featured in the book “Colleges That Change Lives,” listed on the latest President’s Higher Education Community Service Honor Roll with Distinction, and included in the U.S. News & World Report and Princeton Review “best colleges” lists. Learn more at www.owu.edu.